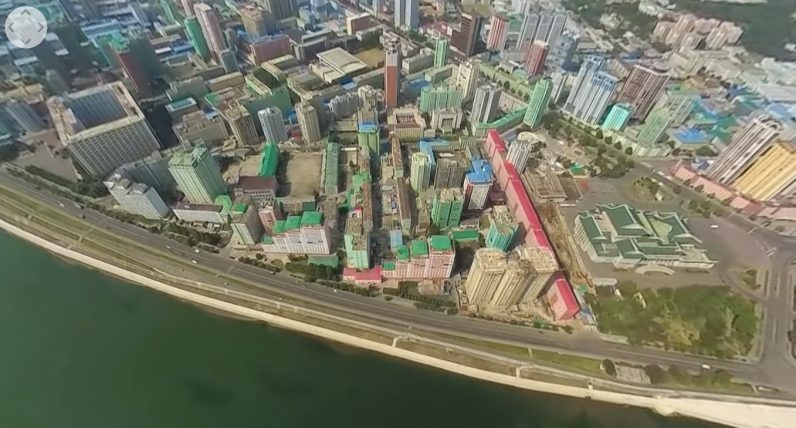 Singaporean photographer Aram Pan was recently given a once-in-a-lifetime opportunity when North Korean officials allowed him to shoot and release 360 video on a short flight over the capitol city of Pyongyang. The significance of this being the “world’s first” 360-degree overhead video comes from the perpetual media blackout in the Democratic People’s Republic of Korea – which is heavily enforced under dictator Kim Jong Un. The state restricts photography of all kinds and censors media with an iron fist. Perhaps it’s because I don’t see them as the terrifying people everyone thinks they are and I guess they feel that. I find that the friendlier I am, the more they naturally reveal themselves to me. There’s an old saying, “A gentle answer turns away wrath, but a harsh word stirs up anger”. His imagery is quite remarkable, and while it’s obviously been edited – Pan says he was able to keep about 90 percent of his photographs – it shows the hidden country in a way we haven’t seen before. I’m taken aback by the sterility of the environment in North Korea. In the video you barely see any traffic, there doesn’t appear to be any masses of people anywhere, and there isn’t a single piece of advertising in sight. It’s amazing to think that North Korea was, basically, destroyed in the 1950’s as a result of the Korean war, yet today it’s remarkably beautiful — if not a little ghostly.